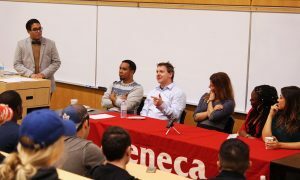 On October 10th, Seneca School of Media hosted five amazing successful journalism professionals, who also happen to be Seneca Alumni. 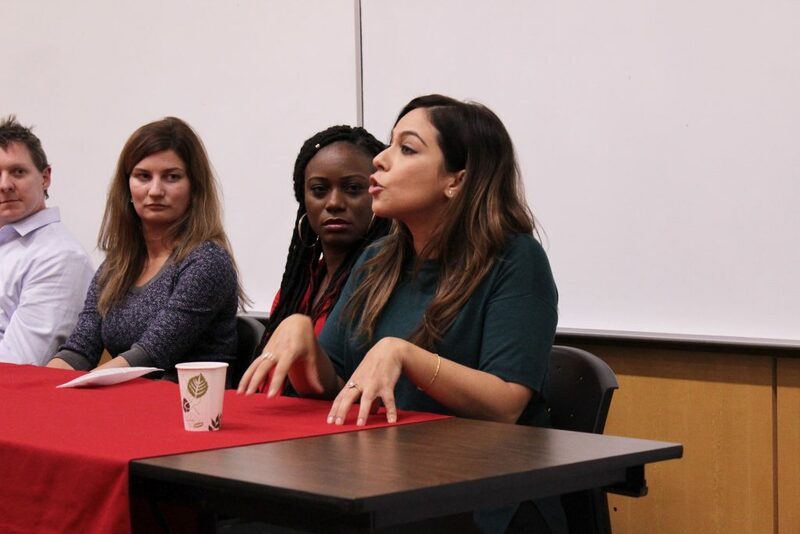 Their wealth of experience lent itself to an incredible discussion about time management, social media best practices, mental health and habits of successful journalists! 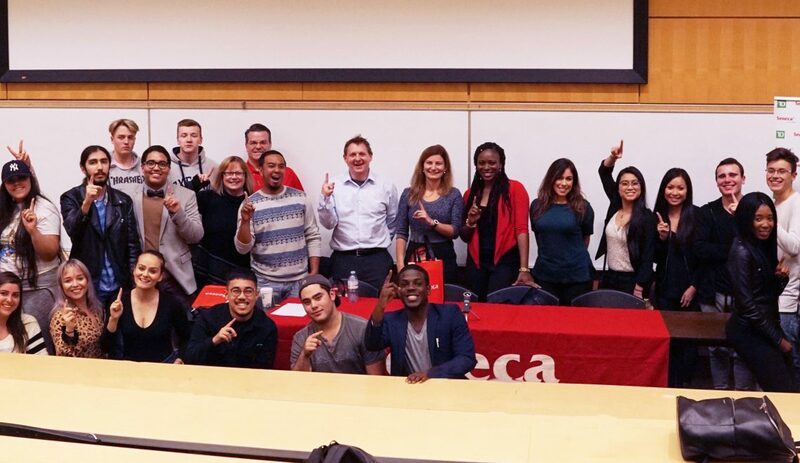 It was truly heartwarming to see these incredibly accomplished individuals who occupy positions in such places as CNN and MuchMusic, take time out of their busy schedule to talk to the current Journalism students. Here are few things they said to inspire them as role models. This is what I really want to do with my life. 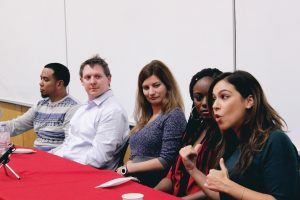 Stephanie Bertini who currently reports for NBC6, could not stress enough that when you choose to Journalism, you need to give it a hundred percent and be passionate about it. It isn’t simply a choice of career, but a way of life. As a journalist, you may have have to sacrifice at times. Maybe you won’t spend as much time with your friends. Perhaps you might miss a baby shower or two. But being a journalist entails a life in public service, which in itself is the most rewarding aspect of the job. As a successful journalist, Stephanie says with great amount of triumph that every ounce of hard work you put into your journey is a product of passion. There couldn’t possibly be anything more satisfying than seeing yourself grow and earn accolades. When you realize that this is what you want to do, that this is who you were meant to be, then you will find yourself in the position you dreamt of. Coffee runs as an intern are a test, do not think yourself beneath this. Consider it an opportunity. In response to a student question, that inquired whether internships demand the cliched coffee runs, Patrick Malkin replied with a mild affirmative. He said that nowadays, sending an intern for a coffee run has become a way of gauging their mentality. Your reaction when asked to grab coffee, generally reflects your work ethic. Of course, our panelists stated that this doesn’t happen often. However, by successfully completing a task as menial as getting coffee, you display to the employer that you can be trusted with information. You are responsible enough to remember their orders and are genuinely earnest to prove yourself. This essentially opens up the possibility for your boss to then trust you with more skilled tasks. Coffee runs also offer several opportunities. You have a chance to study your surroundings, get to know people and the workplace. This makes it likelier for the employer to hire you after the internship since you well-versed with their culture. You can also create a potential quid-pro-quo situation. Tell your boss that if you get the coffee, then they will read a copy of your work. Its simple JRN folks, you need to identify opportunities and seize them at every given point. Whether it is networking or grabbing coffee, there is always a way to add value to whatever you do, you just need to have the right attitude. The alumni further discussed the important issue of stress management. They acknowledged that journalism is a career where you will always be on the move. There will often be instances when you might be working on projects without a break. The profession keeps you on your feet, and can demand a lot from you physically. However, Madeleine who has worked in the entertainment field, had a unique perspective on managing the stress. She states that it is important to prioritize work and manage your time by approaching projects on the basis of their importance. This is a skill most journalism students pick up at Seneca. What can really help during long hours of work though, is simply enjoying it. Madeleine states that journalists are in a unique position, where they are right in the heart of a developing story. They are in the loop, and know things no one else does. This is a rare opportunity that should be savoured. While, it can be taxing, she urged the students in the audience to appreciate this amazing experience. For her, moments spent in the field were unforgettable. To handle the intensity of a journalism career, find some balance by having a secondary passion or hobby that’s just for you. Janelle Griffin from the CNN Newsroom added to Madeleine’s advice on stress, by offering some interesting tips and tricks to managing it successfully. She stresses on the importance of keeping on top of your mental health, which can take a toll in any profession. When work becomes overwhelming for Janelle, she detaches herself from it for a while, and partakes in an activity that is far removed from it. She urges the students to do the same. It is imperative to find an interest or hobby like singing or yoga, that you can turn to for relaxation. This is imperative to maintaining a balance that will ensure success going forward. As an added tip, Stephanie suggested maintaining a diary for catharsis. We cannot stress enough how important this advice is to our students. We know that every one of you is incredibly hardworking and dedicated, so it is equally important to know when you need a break. Your success is dependant on your mental health, so please take care of it! It isn’t all doom and gloom guys, you can have so much fun doing what you love! 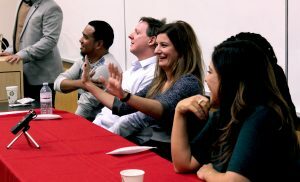 A major theme that emerged from the alumni panel was that it is so important for students to realize just how much they are going to love what they do. This was perhaps the most inspiring advice they could receive. It is encouraging for prospective journalists to see that those in the positions they aspire to be in one day, love their jobs so much. Jeff Landicho echoed a similar sentiment when he spoke to the students. 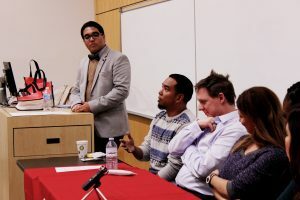 When he began his journey at Seneca College, he admitted to having certain personal issues, which made his success crucial. Failure was not an option. So, he made an incredibly smart move. He merged his his determination and passion for journalism with something he truly loved; basketball. By doing this, he carved a path for himself that he would enjoy and cherish, which would make success inevitable. Today Jeff produces shows for the NBA! Along with these words of wisdom, every alumni on the panel said one very important thing: the demo reel. This is what you will take with you when you step into the field. Seneca Journalism students have the opportunity to cover some amazing stories, and get hands-on experience in the classroom by means of doing newscasts and attending press conferences among (several) other things! This gives them ample content to put into their demo-reel. 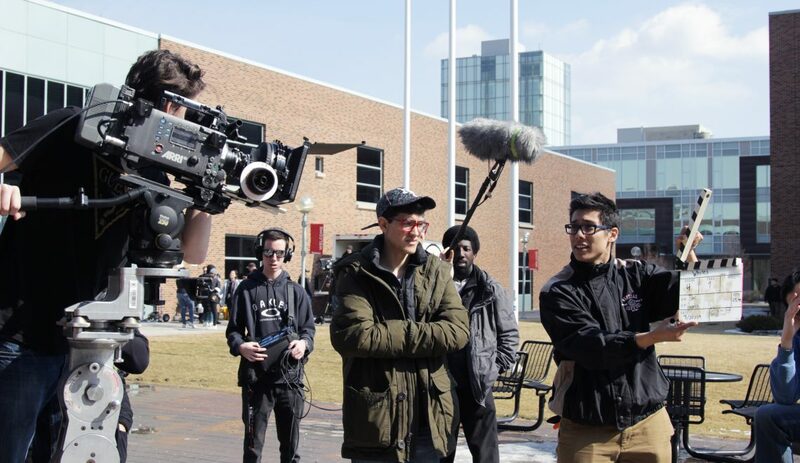 Our alumni emphasized the importance of making use of these opportunities, to make the demo-reel stand out. 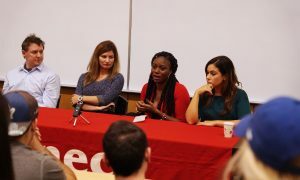 They urged students to proactively search for stories, and take advantage of the equipment and expertise available at Seneca. Make it diverse, make it interesting and make it a reflection of who you are as a journalist. Include as many stories as you can, but ensure that it is high-quality content. This is the stuff that will determine your success in the field. The panelists shared stories of how hard they worked on their demos to inspire and encourage students. Patrick even said that he would often be found in the studios doing multiple internships 24/7. Now that is dedication! So there you have it team! Such was the amazing alumni panel! The students learnt so much, and left inspired. 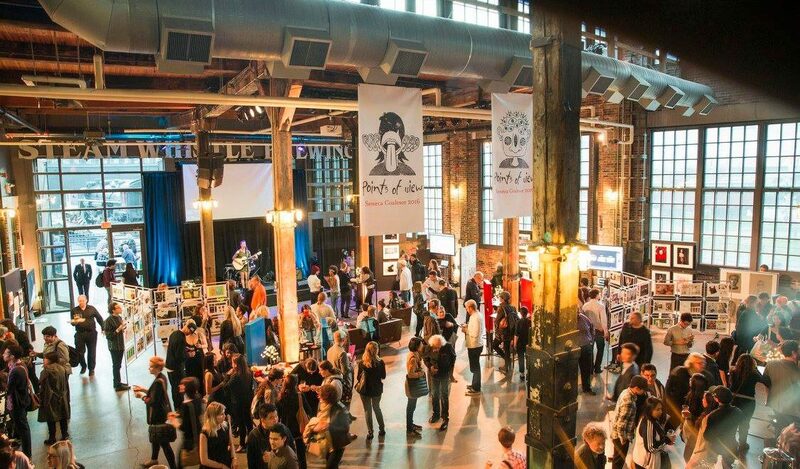 They had an opportunity to network with some incredibly successful individuals, who were once in their shoes. They took away helpful tips and tricks, and left with a positive energy. 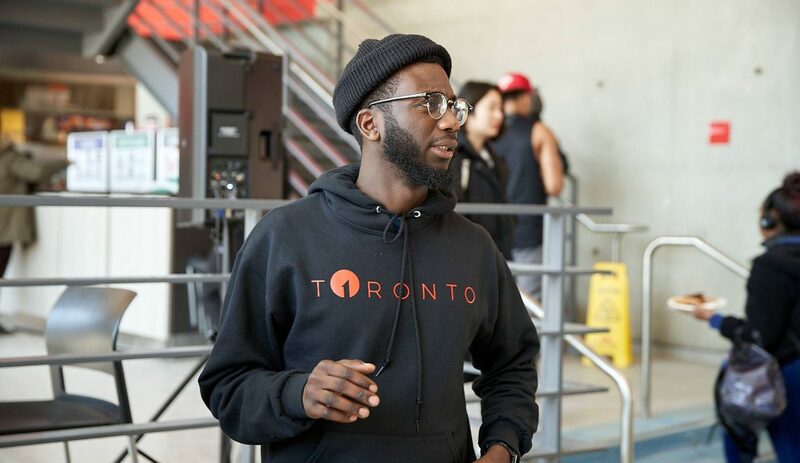 We are so proud of our Seneca Alumni and their achievements, and can’t wait to see the current students follow in their footsteps through their hard work and dedication. If you missed the panel, and would like to hear the full version of their advice, stay tuned for our Alumni Advice Podcasts that will be available very soon!.